Hamsters weren't always as prolific as they are today. There was a time when they were rare little critters, and if it weren't for the tenacity of Israel Aharoni, a biologist who lived in the 30s, they may never have come to be known as one of America's most popular pocket pets. Because of his dedication in bringing this species back from the brink of extinction, hamsters are a favorite pet among young children. Today's Syrian hamsters are direct descendants of Aharoni's breeding pairs. Hamsters are frequently thought of as "starter pets" for young children. Hamsters don't require as much attention as dogs and other common pets, so even young children can care for them if the parents are sure the children are mature enough. Syrian hamsters are the best choice for a child's first hamster, as they are larger than other hamster breeds. However, Syrians are notoriously territorial, so in the name of hammy happiness and safety, have only one per cage. Opt for a young hamster, and teach your child how to gently handle him. Handle the hamster a lot, the right way, and he'll become more tame and content over time. 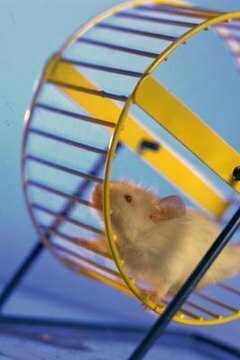 Hamsters are relatively easy to care for, though they do have specific housing and husbandry requirements. Your hammy will require a clean habitat and plenty of things on which to chew to wear down his always-growing incisors. And although a pet store is a great place to purchase hamster supplies, it isn't the best place to get a hamster, try to find a reputable hamster breeder or, at the very least, learn all you can about where your hamster came from. You can adopt from a local or online rescue organization in some cases. Hamsters are truly clean animals; they busy themselves with keeping their habitat and themselves clean and tidy. Their activities during the day are fun to watch as well as educational. Children learn a lot about animals by simply observing them. When handled with great care, kept well-nourished and free of external and internal parasites, and kept in a habitat at least 2 square feet per hamster, a hamster can live about 3 years. Hamsters are most lively in the night, so keeping a cage in a room with a child who is a light sleeper may not be the best idea. The sound of a squeaky exercise wheel may be annoying. Hamsters are mostly healthy but when stressed are easily troubled with diarrhea, a condition that is usually fatal to a hamster. If a breeding pair is allowed to live together, keep in mind that females can easily have four to five litters a year, with anywhere between four and twelve babies each, so unless you're in the business of breeding hamsters, keep just one per habitat. Wild hamsters are loners who seek out the company of other hamsters only when it's time to mate. Should Hamsters Be in the Dark at Night?